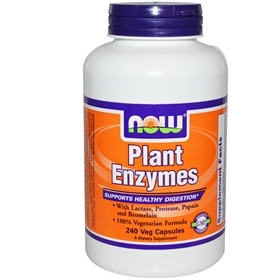 Processed foods with additives, preservatives, nitrates, etc., do not contain the digestive enzymes needed for proper digestion and absorption of nutrients. Because our diet is made up mostly of these foods, our bodies are deficient in many nutrients, and we need to supplement. These foods also create harmful bacteria & yeast overgrowth in our gut causing inflammation that leads to illness. Enzyme-free foods force your body to steal enzymes from other parts of the body, just to digest, rather than using the enzymes from the food itself to do the job. This depletes the limited supply of enzymes we have in our body. Low enzyme levels are associated with old age. In fact, as we age we have fewer enzymes available and normal digestion slows down. This in turn affects the absorption of nutrients, which then leads to sickness and disease. Suggested Usage: As a dietary supplement, take 1 Vcap® 1-2 times daily with meals. Other Ingredients: Rice Maltodextrin, Cellulose (capsule), Magnesium Stearate (vegetable source), MCT (medium chain triglycerides) and Silica. Vegetarian/Vegan Product.